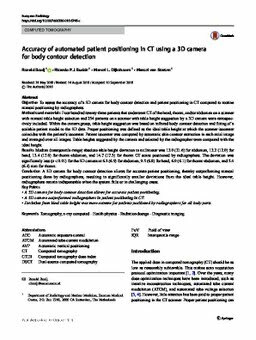 Objective: To assess the accuracy of a 3D camera for body contour detection and patient positioning in CT compared to routine manual positioning by radiographers. Methods and materials: Four hundred twenty-three patients that underwent CT of the head, thorax, and/or abdomen on a scanner with manual table height selection and 254 patients on a scanner with table height suggestion by a 3D camera were retrospectively included. Within the camera group, table height suggestion was based on infrared body contour detection and fitting of a scalable patient model to the 3D data. Proper positioning was defined as the ideal table height at which the scanner isocenter coincides with the patient’s isocenter. Patient isocenter was computed by automatic skin contour extraction in each axial image and averaged over all images. Table heights suggested by the camera and selected by the radiographer were compared with the ideal height. Results: Median (interquartile range) absolute table height deviation in millimeter was 12.0 (21.6) for abdomen, 12.2 (12.0) for head, 13.4 (17.6) for thorax-abdomen, and 14.7 (17.3) for thorax CT scans positioned by radiographers. The deviation was significantly less (p < 0.01) for the 3D camera at 6.3 (6.9) for abdomen, 9.5 (6.8) for head, 6.0 (6.1) for thorax-abdomen, and 5.4 (6.4) mm for thorax. Conclusion: A 3D camera for body contour detection allows for accurate patient positioning, thereby outperforming manual positioning done by radiographers, resulting in significantly smaller deviations from the ideal table height. However, radiographers remain indispensable when the system fails or in challenging cases. Key Points: • A 3D camera for body contour detection allows for accurate patient positioning. • A 3D camera outperformed radiographers in patient positioning in CT. • Deviation from ideal table height was more extreme for patients positioned by radiographers for all body parts.